Coffee — it’s accessible and affordable and enjoyed around the world thanks to people like Dr. Frederick Kawuma. Kawuma ’16, a Regent University School of Business and Leadership (SBL) alumnus, has successfully managed and founded organizations serving Africa’s coffee industry. Armed with experience from working in both government and the private sector, his newest endeavor will help ensure there’s a solid base of revenue for the Inter-African Coffee Organization (IACO) — a multinational, nonprofit organization that helps coffee producers in 25 countries compete in markets and grow businesses that bolster African coffee trade and industry. Although Kawuma initially heard negative predictions about IACO’s future when he was introduced to the prospect of working for the organization, he felt led to step forward after praying about the opportunity with his wife. What some saw as a lost cause, he saw as a calling. 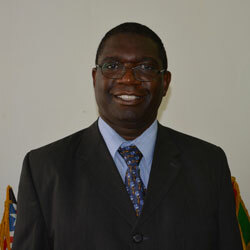 Having been brought on as the group’s secretary general, Kawuma proposed they construct a rentable office complex in Abidjan, Côte d’Ivoire. When complete, it could serve as a revenue base for the organization’s endowment. He was able to work with government officials to secure a government donation of 6000 square meters to build the center on. Although most architects turned Kawuma’s project down, he eventually found one willing to take the task. “I told him that I was a man of faith, and that I believed in a God of miracles who would provide for us as we went along,” he said. Kawuma credits the Lord with giving him inspiration for the project. Construction is set to start in December 2017. In short, it’s a long-term solution that will help resolve IACO’s financial struggles and set the nonprofit on a path of success. Furthermore, the countries that could benefit from IACO have shown a willingness to contribute if the center succeeds, he said. This is not Kawuma’s first time working in organizational leadership. He draws on experience grounded in successful past endeavors. In East Africa, he worked to bring private sector coffee producers market liberalization and education on trade economics. Before that, he said coffee markets in parts of Africa were once burdened by regulations and infrastructures that kept producers from receiving optimal offers. The liberalization strategies he assisted in opened opportunities for multiple companies, rather than singular agencies, to compete for farmers’ business and thus offer them better, more competitive offers for their coffee. Kawuma helped form the Uganda Coffee Development Authority, and then worked to assist in the creation of an organization that would educate coffee exporters so they could maximize their potential in a liberalized economy. He then formed the organization into a legal entity which would come to be known as the Uganda Coffee Trade Federation. He then shifted to consult coffee producers in the private sector and, along with other colleagues, created the African Fine Coffees Association (AFCA). Kawuma also mentioned he’s working on another project with an African banking organization to create a fund for coffee farmers. The fund will help provide the farmers with better working conditions. He said being skilled in organizational leadership has been vital in his career, and he considers the principles and training he received while studying for his Ph.D. at Regent University as invaluable. Although secular organizations see profit as a chief end, Regent reinforced principles that dictate a different priority, according to Kawuma.